The Uniform Law Commission (ULC), formerly known as the National Conference of Commissioners on Uniform State Laws (NCCUSL), was created as an offshoot of the American Bar Association and held its first convention in 1892. Every state has enacted a law to authorize the appointment of state representatives or “commissioners” to the ULC, each of whom must be an attorney. The commissioners meet annually to “consider state laws, determine in which areas of the law uniformity is important, and … draft uniform and model acts for consideration by the states.” By 1912, every state had designated commissioners and was participating in the ULC. Operating for more than 120 years, the ULC is the nation’s oldest state governmental association. Since its inception in the 1890s, the ULC has drafted more than 300 uniform laws on numerous subjects and in various fields of law. Examples of uniform acts include the Uniform Commercial Code, Uniform Probate Code, Uniform Child Custody Jurisdiction Act, Uniform Partnership Act, Uniform Anatomical Gift Act, Uniform Limited Partnership Act, and Uniform Interstate Family Support Act. More than 100 uniform laws have been adopted by more than one state, and Colorado has enacted more than 100 uniform laws. The ULC’s stated mission is to provide states with non-partisan, well-conceived, and well-drafted legislation that brings clarity and stability to critical areas of state statutory law. Its goal is to simplify the legal life of businesses and citizens by providing rules and procedures that are consistent from state to state. In addition, the ULC sees itself as an efficient mechanism benefitting all of the states, not only because the almost 400 commissioners are willing to donate their time and energy to the uniform law movement, but also because participation in the ULC represents a cooperative effort by all of the states. Equally important to the ULC is that it offers a means to strengthen the role of state law within the federal system. As new technology evolves and increasing mobility increases cross-boundary legal effects, consistency in rules and procedures becomes ever more critical. Incorporates input from legal experts, advisors, and observers representing the views of other legal organizations or interests. 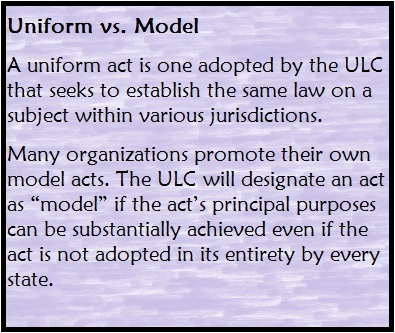 Although called a “uniform law” and approved by the commissioners at their annual conference, a uniform law adopted by the ULC is not law anywhere in the United States. It is actually a legislative proposal addressed to 50 state and three territorial legislatures. As with any legislative proposal, a legislature may alter draft language to “fine tune” the proposed uniform law to better fit an individual state or territory’s current law or needs or other special local conditions. So even when considered “uniform,” there may be variances in the law from state to state. In addition, uniform laws, like all state laws, may be revised from time to time to keep up with changing conditions and policies within that state. So what’s the point if uniform laws are not always uniform? While uniformity is the original aim of the ULC and its process, law revision or reform has become a significant outcome as well. The ULC also considers topics for legislation where state-to-state variance does not create a serious problem for conducting business or interstate mobility. In addition, the ULC may consider proposals to bring certain state laws more up-to-date. For information on Colorado’s ULC connection, visit the website of the Colorado Commission on Uniform State Laws (CCUSL).